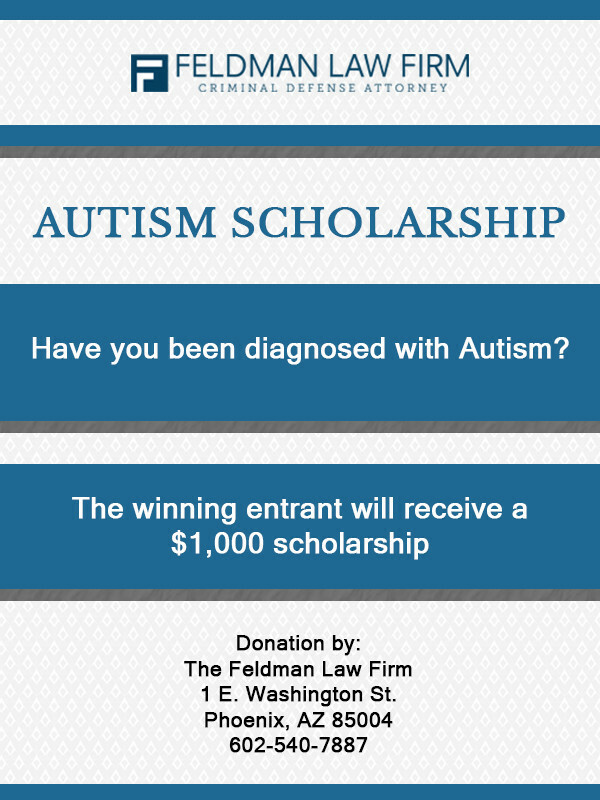 The Feldman Law Firm is proud to announce that it will be awarding a $1,000 scholarship for the benefit of individuals with Autism Spectrum Disorder (ASD or Autism). The aim of the scholarship, which will be in the form of tuition assistance, is to encourage those with ASD to continue their education. Autism is a neurodevelopmental disorder that affects a person’s communication and social skills. ASD symptoms vary widely, but include difficulty understanding the thoughts and motivations of others. The diagnosis of ASD may include a number of conditions that were at one time separately defined, such as autism, Asperger’s syndrome, pervasive developmental disorder, and childhood disintegrative disorder. ASD presents challenges for those who have been diagnosed with the disorder, among them challenges in the area of education. The scholarship is in the amount of $1,000, and is being offered as an incentive to those persons diagnosed with ASD to continue their education. The scholarship fund will be applied to defray a portion of the tuition cost for attendance at a university or college, junior college, or vocational school. Applicants do not have to be enrolled in school at the time of submission of their application, but the scholarship fund must be used within one year from the date of the award. The scholarship being offered by The Feldman Law Firm is open to anyone who has been diagnosed with ASD (DSM-V) who would like to continue their education at a vocational school, college or university. All application materials must be submitted on or before February 15, 2018. (Optional) Prepare and upload an essay (up to 850 words in length) discussing how ASD has affected your education. We may also request proof of your diagnosis. The selection of the recipient of the scholarship will be made by Adam Feldman, founder of The Feldman Law Firm, at his sole discretion. Mr. Feldman will announce his decision no later than March 15, 2018. When you furnish information to us, it becomes the property of The Feldman Law Firm. However, we do not sell or disseminate your information to any third parties, except in connection with publicizing or reporting on our scholarship program.